50 sq ft studios: Thinking about making the A Place for Everything Bag? Here's my take on it! Thinking about making the A Place for Everything Bag? Here's my take on it! I figure that it’s time that I start posting reviews on here, so I will start with something near and dear to my heart, the A Place for Everything Bag from Annie Unrein of Patterns by Annie. If you happen to have found the link to blog from my Instagram profile, you probably know that I’m a massive fan of this bag. For those of you that haven’t seen the pictures, I have made the bag 4 times, and I’ve had the great privilege to make it for a couple of my favorite sew-lebrities (aka sewing celebrities). It is probably one of my favorite bags ever. At first glance of the pattern cover, you will probably assume that the bag will be a lot of work. That assumption is correct; however, a lot of work does NOT mean that it is not doable. The materials list might also be a little scary at first glance. With required materials that include clear heavyweight vinyl, mesh, hook and loop tape, Soft & Stable foam stabilizer (or suitable alternative), and 5 yards of zippers (yes, 5 yards…seriously), this bag is not a super quick, one-day project. It will be quite a bit of work, but I think it is absolutely worth it. This bag is made to last, and it is very easy to customize the bag to suit different needs. I love so many things about this bag. I love that there are different size pockets to choose from, and I love that the pages attach into the bag with hook and loop (Velcro) tape so the pockets pages can easily be swapped out for another style of page. I love that it holds so much stuff and yet it is still portable. I love that I used some of my most treasured fabric to make my bag extra special to me. Since I’m being totally honest, part of me even loves that the bag can be a little intimidating so you don’t see everybody else carrying one. One factor to consider if you are thinking about making this bag is skill level. 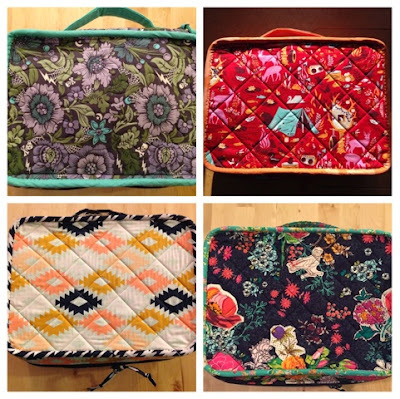 I really can’t recommend this as a project for a person that is new to sewing. Some of the materials can be fussy to work with even for people with a lot of sewing experience. You will also be dealing with sewing bulky materials, a brand new sewist might find the whole process frustrating. Reading the pattern directions and following the steps in order will be essential for the best results. When I first made this bag, I would have probably lumped myself into the advanced beginner category, but I tend to do pretty well with following directions on my own. For people that prefer to watch videos instead of reading a sheet of instructions, Annie Unrein of Patterns by Annie offers a class on making this bag on Craftsy as part of her two project Sew Sturdy Travel Organizers class (it’s called the Everything in Its Place bag in the class, but it’s the same pattern). I did watch the class, and the videos were excellent. Another thing that may be shocking (especially for people that don’t make a lot of bags) is the cost of the materials. Before fabric, you can expect the materials in this bag to run about $60-80 before tax and/or shipping depending on local availability of parts. It isn’t inexpensive. Again, use of the recommended high quality materials makes this bag built to last. Does this mean that you can only use certain materials from specific sources? No, but I would really recommend using high quality handbag zippers (size 4.5 YKK zippers are my pick) and heavyweight vinyl (12 gauge would be the minimum that I would even consider, but I prefer the 16 gauge for durability). With the 3.5 yards of fabric required (1.25 yards for the main fabric, 1.25 yards for lining, and 1 yard of contrasting fabric) on top of the materials, I’d recommend to select fabrics that you really love. Annie stocks all of the materials that you will need for this bag on her website with the exception of the fabric, and I wouldn’t hesitate to recommend purchasing from her (I get no kick backs or freebies for endorsing her shop or her products, it’s just my honest opinion). Invest in a Teflon/non-stick foot for your sewing machine. I absolutely recommend a Teflon/non-stick foot for use on the vinyl. If you do not want to make the investment in another sewing machine foot, you can use a piece of tape on the underside of your machine foot (especially if your foot is plastic) to help the vinyl glide more smoothly and reduce static which further hampers movement. Using the paper that almost always comes with vinyl can also be handy, though it is not fantastic to use if you sew through it. Picking little bits of paper out from under a line of stitching isn’t the most fun thing to do. A roller foot can be a decent substitution, but I’ve found that clear vinyl doesn’t move as well as leather and oil cloth with the roller. Plus, I’ve seen roller feet leave marks on clear vinyl that don’t ever come out. Get some Clover Wonder Clips. I prefer the smaller, red (or the special edition pink) ones to the Jumbo size (green or purple in color). These will be invaluable for pleating the vinyl and holding the layers of your bag together as you are sewing. Pins will leave permanent holes in the vinyl, and you will probably find that pins (even the really good ones) will bend when you try to pin multiple layers of Soft & Stable (or whichever foam stabilizer you choose) together. Use your walking foot. If your sewing machine has a walking foot or dual feed, you will want to use it for this bag. It will keep the layers from shifting as much when you are sewing. Read the instructions. Yes, read the instructions. Read all of it. Read them before you start, and read them as you go. Seriously. It does help, and it will make the bag easier to accomplish. Annie’s instructions are well-written. Use handbag zippers not regular skirt and dress zippers. Size #4.5 handbag zippers (these are the size that Annie sells) have a wider coil and a wider tape than standard dressmakers zippers. They don’t have the chunky plastic teeth like you will normally see on separating zippers. The handbag zippers are durable, and the wider tape makes zipper insertion easier. When I use them, I find that I rarely even need to change from my ¼” foot to a zipper foot. Zippers by the Yard are super handy for this project and will minimize the waste from trimming off the ends. The only words of caution I will offer is to make sure that you are tacking the cut ends of the zippers so you don’t accidentally yank the zipper pull off of the coil. Think about using 16 gauge heavyweight vinyl. As with many materials, the thicker the material, the more difficult it can be to sew. A lighter weight vinyl would make the bulk easier to sew, but it won’t be as durable over time. Objects placed in the pockets can use lighter vinyl to warp out of shape more easily and the likelihood of an object being able to puncture the pocket increases. Take your time with the vinyl and make sure you are using a good needle. I’ve had great success with a size 90/14 needle for all stages of this project. I’ve successfully used topstitch, microtex (sharps), and quilting needles with all of these materials across a variety of bag projects. Use Soft & Stable stabilizer if possible. The pattern recommends using Soft & Stable foam stabilizer. Yes, the person that wrote the pattern is the person that developed the product, but it is an exceptionally good product. I use it quite frequently in bag patterns from other companies, so it's not limited to use in solely Annie's patterns. It gives the bag stability, and the knit on both sides of the foam makes the product much easier to work with (automotive headliner is similar but has raw foam exposed on one side). It is also lightweight which is very important because the bag can get heavy if you really load it up with things like all metal pairs of scissors. Use acrylic/Plexiglass for the spine stabilizer insert. The pattern recommends a 3.5” x 6.5” piece of Plexiglass, foam core, or heavy cardboard for the stabilizer. I highly recommend acrylic/Plexiglass. If you have a store like Tap Plastics in your area (I believe you can order online from them too), you can have them cut a piece for you. I’d recommend having them round the corners so that the sharp 90 degree corners don’t cut into your fabric. Using the more rigid insert will provide the bag with better support when being carried. Think about how you’ll use it. When you are planning your project, really give some thought to how you will use it. I use mine for general sewing supplies. It is the bag that I always take with me to a class, and I even use it a lot at home (I usually buy 2 of most notions so one always lives in my bag and one stays at home in my sewing desk) for some of my important but lesser used supplies like the ¼” clear elastic I use when I make garments and my good fabric scissors. I even keep my straight stitch plate for my class/travel machine in one of the pockets. I know people that use their bag for English Paper Piecing projects/supplies, and people that use them for their applique supplies. These different uses can change which pockets might be the most useful. One thing that I do differently is press my binding. Annie recommends not pressing your binding strips. I find that not pressing my strips increases the chance of the bias binding twisting, so I press mine just as I do the binding on my quilts. I also take a couple of extra hours (yes, hours) to hand stitch my binding (I machine sew it on the front of the pocket pages and on the zipper side strip side of the exterior pieces and fold over and hand sew on the opposite side). I am rarely ever satisfied with machine binding on any project, so hand stitching allows me to get a cleaner finish. It can literally be painful to hand bind the bag (you will have to push a needle through Velcro which is the complete opposite of what I’d consider to be fun). I forgot to add this one into my original post, so this is an addition as of 11/16/14 - One other thing that I do when I make the pattern is trim back the fabric/Soft & Stable in the seam allowance prior to topstitching the zipper to the zipper side strip pieces. You don't have to trim it back very far, it just needs to be enough so that the edge is totally encased by the zipper. If you don't do this, you may find that you see a little bit of the raw edges sticking out. I wasn't entirely pleased when I noticed this after finishing my first A Place for Everything bag, so I made a strip of bias tape and attached it so that it would cover that area. I've trimmed the seam allowance on all of the other bags that I've made, and I've been much more happy with the results. So, that's about it. I hope that I've covered some of the questions that you might have about this bag. If there's anything that you'd like to know about the bag, please comment below! Thank you for posting a review of this bag. I am currently making it and am reassured by your suggestions, especially since I did all of these myself. I was somewhat confused by the instructions on page 8 regarding the number of zippers to make for each style of pocket. In my bag I am making two Style 1 pocket, one Style 2 pocket and one Style 3 pocket. I am specifically confused by the following: "five single-slide 12" zippers for one page each of Style 1 and 3 pocket" and "five double-slide 12" zippers for one page each of Style 2 and 4 pockets." This seems like a huge amount of zippers and I did not have enough Zippers by the Yard to cut this many (I hope my question is clear). I studied the picture on the cover of the pattern and made the number of zippers I guesstimated I needed. I have yet to construct the vinyl pockets for the bag and hope that I have guessed correctly since it's too late to make any additional zippers as I only have about 12" of Zippers by the Yard left over. Could you please clarify the instructions. I plan to make more of these bags, but would like to make them correctly. Thank you. Hi! My typical configuration is also 2 of Style 1, 1 of Style 2, and 1 of Style 3. I am able to cut all of the zippers for the vinyl pockets from a single package of Zippers by the Yard. Page 8 gives you requirements for both sides of the page instead of how many for each style, so I wonder if that's the confusing part. 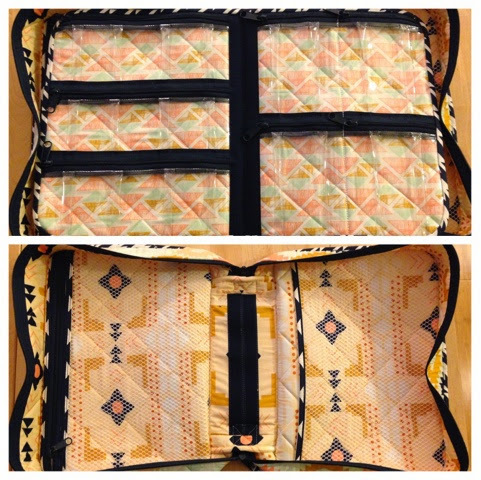 If I was going to make the same configuration, I would need a total of 7 single slide zippers (3 for style 3 and 4 for style 1 since you are doing 2 of them) plus 2 zippers with 2 sliders (this is my personal preference so the divided compartments may be opened individually) for the style 2. SOOOO, 9 zippers (with a total of 11 pulls) will take care of the vinyl pockets with your configuration. Don't forget that you'll need one for the internal mesh pocket too. The Zippers by the Yard package is 4 yards, so having about 12" left sounds about right to me if the zippers are cut a smidgen wider (I usually cut mine a little longer than what's needed). Does that help? If not, please let me know. Thank you so much for your response. You are correct, that is where I became confused with the pattern. I appreciate your clarification. It sounds like I'm on the right track and feel like I can continue selling the back with confidence. I read your post. It was very nice. Thanks for sharing such a informative post. Your review is excellent! I have a client request for one. Thanks again! Want to know where I've been?